You are here: Virgin Islands News Online » News » St George’s School sacks principal! Parents and guardians were served a letter notifying them of the impending changes for the new school year at St George's School. It was signed by the Chairman and Deputy Chairman of the Board of Directors Mr Gerard C. Farara Q.C. (in picture) and Father Ronald Branche respectively. Concerned about what seems to be a high turnover rate of principals at the secondary division of St George’s School, the decision to hunt for another was brought to the attention of this news site by a concerned parent- a concern also shared by teachers attached to the school. Parent and guardians were given letters notifying them of the impending changes that are set for the new school year. It was signed by the Chairman and Deputy Chairman of the Board of Directors Mr Gerard C. Farara Q.C. and Father Ronald Branche respectively. “As announced at the meeting we have decided to change the current principal. Regrettably the existing plans of the administration and the expectations of our parents have not been realized during this school year. In order to put matters back on track, we took the bold step of appointing the Vice Principal, Mrs. Gonzales, and the senior teacher, Mrs. Faith Ann Adams as temporary joint administrators, to take on the role and task of addressing the issues of immediate concern and working towards a positive outcome for the school community,” the memorandum stated. Contacted as it relates to the sacking of the principal and the other surrounding issues which have apparently plagued the school, Mr Farara indicated his willingness to sit with this news site at a more convenient time to discuss the issue. He declined to comment further except to dispel the claim that the school has had a high turn-over of principals. According to the Board Chairman, the new principal expected to take over in September 2013, will make number 4 for the 9-year existence of the school. He said the first principal’s stint was short lived at his own choice, the second spent about six to seven years and Ms Beverly J. Hinds-Callwood, whose service is being terminated by the Board, would have been the third. 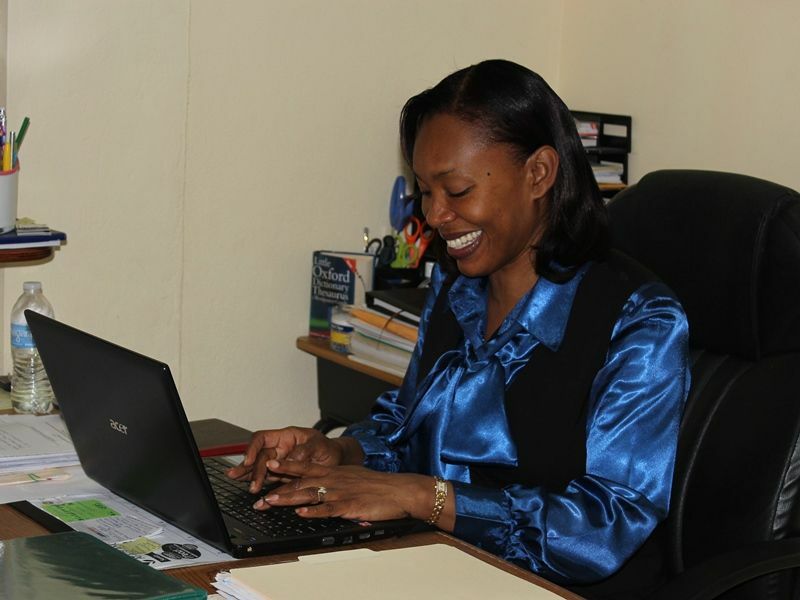 Ms Hinds-Callwood who had also offered to discuss the issues surrounding her being sacked from the principal’s position at the St Georges Secondary School was not comfortable to speak until after the graduation exercise on Wednesday June, 27, 2013. Efforts to reach her on Thursday proved futile. She had, however, told Virgin Islands News Online that “the school has a board and the board has made their decision. They cited poor performance,” Ms Hinds-Callwood said. She did admit that the school had performed at its worse in its history this year, but noted that it was unfair to cast the blame at her heels as she was not given sufficient time and opportunity two make her mark for the better of the school. Ms Hinds-Callwood has been at the school for about two years, one year as a regular teacher and the second as principal. She said that at the beginning of the first academic term she was faced with the challenge of a shortage of three teachers and even had to shift her focus on filling in as a full time teacher in the best interest of the students. “I couldn't focus on the administrative aspects until the second term. My duties as principal had to be pushed aside. It wasn't until the second term that I got into my principal duties and before the end of the third term the board has sited poor performance. In my mind that is not fair as I was not given the opportunity to perform and prove myself,” she noted. According the Hinds-Callwood, who appeared very discrete and humble at the situation, there are many “intrinsic things” that need to be addressed in the school. “A lot of things need to be addressed, I don’t want to say further at this time but lots, lots, need to be done within that school system and they were not fair to me given that I was in the position under a year when they made the decision,” she added. 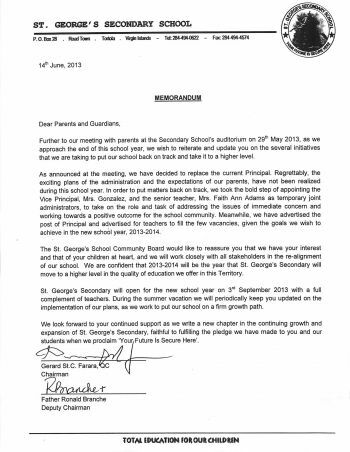 The letter circulated had given the indication that the school has been hit with a shortage of teachers also. “Meanwhile, we have advertised the post of Principal and advertised for teachers to fill the vacancies, given the goals we wish to achieve in the new school year, 2013-2014,” stated the circular. While we were not able to secure the full break down of the school’s performance at this year’s School Leaving Examinations, we were able confirm that of the 15 students who sat this year, 11 passed and there is a likelihood that there will be one more added to the pass number as a matter is reportedly being sorted out at the level of the Ministry of Education. well saw in the middle of gruduation???? Well if you spell GRADUATION "GRUDUATING" it is safe to say you never participated in one. and your point being.......she is married to a local person isn't she? Furthermore why do one have to care if they hire a local person or not as a parent of the school my main concern is my child's education am paying a hefty school fee for a reason.....So whether they higher a local or not it matters not Quality Education and the head who insures that this is done is what I require. Now tell me, which one on the last name in tortola is local, all the people were brought to this island by ships, they say the arawaks were here first, tell me please how they get here and if so find out what were the arawaks last name, with all u nonesense, all of the come from down or up island to get here. Don't let the door hit ya! Dont think other countries and teachers are not taken notice. I Think that Father Branch & Mr. Fara are unfare to Mrs. Hinds-Callwood. She was not given a fair chance to prove herself. For the first term at the school she had to teach several classes because there was never a full slate of teachers, then the second term came & it was the same thing with even teachers leaving. They need to tell the truth about the school and not blame Mrs. Callwood. They are the ones to blame because they knew what was going on, but now they want people to send their children to the school so that is why they are now coming out & geting rid of Mrs. Callwood. Father Branch please be fair to Mrs. Callwood if you want people to respect you as a Minister of the Gospel. This is unfortunate and would seem to be unfair when you ask a person to be the principle and then have them trying to fill in for teachers who the board should have hired. It would seem that they would have corrected the shortage of teachers before they terminated this educator. Which is down to work permits not being processed in a timely manner. when it comes to the kids education, some priority should be given to the process. You all have some uncute, ill mannered, unpleasant teachers in the primary school that you all need to get rid of especially in the present two class four and you all still have there. They need to tend to pigs and hugs not people children. My child was in one of those classes and was treated like sub human. I am asking the chair and vice chairman of the board to do something and do it now. Other wise!! Are you telling me that no one from the board has investigate this allegation ABOUT CLASS 5 TEACHERS CHEATING? What the heck is the PRINCIPAL AND BOARD doing about this? Are you saying that the class 2 and class 5 teachers were all cheating? What on earth is happening at this school? where is the principal in all of this? I think they fired the wrong principal. the board need to take a strong look at the elementary principal. we cant have cheats teaching our students. The current class 4 teachers were wonderful, they made a significant impact on my child's work. They are no nonsense and disciplinarians. The school system would benefit from more teachers like these two young ladies. My dear you are worried about your child’s education which is your right to, but do not place the blame on your child’s lack of performance where it doesn't belong. There is only so much a teacher can do if parents are not playing their part. Example you choose to reply to this news story and you didn't take the time to learn how “uncouth” or “hog” is spell. Hmmmm- I can just imagine what the child’s homework is like. Please do your part in your child's education before you start pointing fingers at others. At the end of the it 11 students of 15 students graduated, and yet the Principal was sacked. Hmmm, did 11 students truly graduate? It seems that the board need to go back to school. It,s very obvious that they are trying to cover up their failings to appoint additional teachers. I hope Mrs Callsood seeks legal remedy for unfair dismissal. She certainly has much support. hope the poor child was not bully out of a job for sme of deeds pareants have such tactics ..
Shortage of that many teachers?! Seems like the board is passing the buck on this one. They all need to get their act together. Ms. Callwood was given a sieve to carry water, and the Board well knows this. mrs. callwood sometime God sends us blessings in many ways..this could be yours..take it and run with it..teachers and pricipals are always in need of..if u had to teach and still lead then I think that was unfair..again u've got your blessings! you right jerry do what you have to do i know u aint stupid she just shame thats all .its a lot of things going on. who know know. fire them .for the sake of the kids .2yrs and still cant get her act together. She has NOT been there for 2 years. Please read the article again. you are so ignorant to the matter. before u look to post a comment u should really get ur facts right! She has been teaching and trying to do her job both at once. That would be unfair to anybody. SHE IS NOT TO BE BLAMED! I Think that Mrs. Callwood-Hinds did a good job with what she had to deal with. Father Branch & Jerry Farara knew what pressure she was under from the beginning of the school year and they did nothing to correct the situation. They are only now coming & blaming her for the failures at the school knowing well that it is their fault of not having enough teachers & having teachers leaving every term. Youall need to be fare to Mrs. Callwood and not scandal her name making people belieave that she did not do a good job. The fault is on the Board, because youall knew what was going on from the begining and only taking people money for Tuition. Lets face it people- "fairness and injustice" is the order of the day in the bvi. May God help us all. Can someone from the elementary stage of St. Georges please offer some sort of advice for the restructuring of the secondary division. Ms Llandover please help!!!! Too me Mrs.Callwood was The best you could ever have! she showed that she cared about you and you could have come and tell her anything even if you wanna talk she was a chill Teacher. You see yall never see the good in people always see the bad quick to talk about what yall don't know. never did one day Mr Farara Or Father Branche come and sat in the class room to see how we was doing Mrs Callwood would always pass around to call the class room to see what we was doing making sure that we was good they never did that . see yall dont know nothing Mrs Callwood played a role in being a MATH and a SCIENCE teacher and she did a wonderful job at it making sure we understand and she made sure we got it. Mrs Adams * The History and Social Studies teacher* and Mrs Gonzales * The Spanish Teacher* are also like Mrs Callwood they would have to play TWO ROLES LIKE SHE DID. So look at the bright side and give Mrs.Callwood a next chance cause she wants whats best for the school! Did she teach you English, too? You need to learn how to use commas and periods correctly. Needs to let the Principal run the school from constantly meddling and micro-managing. Until they do that, teachers will leave and more principals will come and go. Branche please let the principal do her job. You are spot on, 'The Board'! The St George's Board needs to stop pussyfooting around and deal with the real issues of the school. As the principal succintly put it, there are a number of 'intrinsic things' that need to be addressed adequately before any further steps can be implmented. A carpenter knows that he cannot build a house with out first laying a very firm foundation. Similarly, the Board should know that for a school to run effectively, certains basic things need to be in place. The Principal has only just served less than one full academic school year, hence, it is very foolish of the Board to fire her for incompetence, when they are quite aware, I hope, of the many 'intrinsic things' lacking in the school. It is totally unjust to fire a principal, whom is very experienced in administration, for negligible issues. Mrs Hinds-Callwaood may have faltered along the way, no doubt, like all of us do at some point, but to label her as incompetent is taking it beyond. Any wise administrator will know that a school cannot and will not function efficiently and effectively without sound, prudent decisions. The Board should have advised the principal to acclimatise herself first with the culture of the BVI before making any decisions. I personally believe that that was her downfall, but she should have been informed by the Board. I would only hope, moving forward, that the Board will start being more proactive in the life of the school and stop being only interested in the monetary gains to be derived from it. I would want to think that QC Farara and Canon Branche know that once they start investing real time, money and energies into the school, ensuring that its teachers are well comfortable, fully mandated with the vision of the school, only the student intake will improve drastically. Otherwise, they are just being penny wise and pund foolish. And, NO, I am not a member of staff, neither am I a parent. I am an educator here on the island, and have been folllowing very keenly the goings on of the school. Further I say not. Quality education does not come cheap. This iis karma - it had to happen sooner or later. The Board should be ashamed for the low salaries they are paying the secondary school teachers there. That is why they do not hire local teachers. They cannot hide from the truth.